This Kenwood Navigation, Bluetooth, HD Radio DNX7190HD has it all! This radio comes with Navigation, Bluetooth, Navteq Traffic, HD Radio, and more. Below are just some of the features this Kenwood Navigation, Bluetooth, HD Radio DNX7190HD comes with. DNX models offer the world’s leading GPS navigation system by Garmin. With preloaded NAVTEQ® map data of the United States and Canada, including Alaska, Hawaii and Puerto Rico, choose from different intuitive map view options including split-screen AV control. NAVTEQ provides real-time traffic data for over 90 major cities in North America, including Canada. If traffic is congested up ahead or there is a road closure, the navigation system will automatically re-navigate the route to show you how to get to your destination, quickly and easily! Alternatively, in manual mode, the system will add delay time to your trip so you can decide to avoid or continue on your current route. Navteq Traffic offers great value as it includes a lifetime service subscription. Digital HD Radio broadcasts not only mean CD quality FM sound and great sounding AM, it also means additional information can be broadcast simultaneously such as Song and Title information, Album Art, unique images related to songs, radio station promotions and additional content. USB-enabled DNX receiver models, feature USB connectivity for audio playback from popular devices like iPhone and iPod. Featuring easy-to-use user interface, iPod browsing is a breeze when searching by playlist, artist, album, song, genres or composer. The user can also search by Album Artwork. For added versatility, App/iPod Mode disables the receiver’s integrated control, enabling passengers to control the iPod manually including some selected Apps. The same USB connectivity allows users to connect USB thumb drives and external hard disk drives. 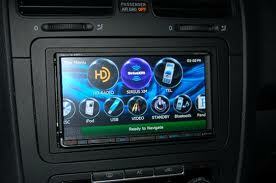 Contact us today to have a Kenwood Navigation, Bluetooth, HD Radio DNX7190HD installed in your vehicle. This entry was posted in Blog and tagged auto news, bluetooth, car accessories, chicago, Custom Radio, Double Din Radio, GPS, HD Radio, Kenwood, Kenwood Radio, mobile electronics, navigation, Radio.